This series tells the saga of the Hmong, members of an ancient clan culture that have been driven across China into Laos and Vietnam, then into Thai refugee camps, and—finally—into the ghettoes of Sacramento, Minneapolis, and other American cities, where many had neither the skills nor the will to survive on America’s terms. In 1961, as part of President Kennedy’s plan to stop Laos and Vietnam from falling like dominoes to the communists, a reckless, fearless CIA agent named Tony Poe forged the Hmong hill tribes into a secret guerrilla army. For fourteen years, the Hmong warriors—some as young as twelve—took on the Lao and Vietnamese communists in the plains and jungles of Laos, saving the lives of dozens of downed U.S. pilots. After the communist Pathet Lao conquered Laos in 1975, they exacted retribution on the Hmong fighters. Thousands were slain as they tried to flee to Thailand. Thousands more died of starvation or sickness in the jungles or drowned trying to cross the Mekong River to freedom. Those who made it wound up in grim refugee camps. Many eventually were resettled in the United States, a place they’d never dreamed of going. They started arriving in California in late 1975, but it was at least ten years before the news media realized they were here—and that they were from a preindustrial, spirit-worshipping culture that was in direct conflict with mainstream American ideas about property, gender roles, medicine, marriage, and justice. In Sacramento, Hmong children would leave their apartment complexes, vault into neighbors’ yards, and swim in their pools—until the neighbors called the police. Hmong shamans, or spirit healers, would sacrifice chickens, pigs, and even cows in their backyards and garages—and neighbors would call the police. I began writing about the Hmong in the early 1990s, around the time I became the Sacramento Bee’s race and ethnicity reporter. I didn’t know any Hmong to begin with, so I started gradually by finding the society’s gatekeepers: a savvy Hmong court interpreter, a Hmong social service agency, and a feminist and community activist who was the daughter of a Hmong woman my wife had met at a farmers’ market. I took the time to get to know them, talking about their lives and the issues confronting their families and community. I also read a few books on the secret war in Laos. Laying such groundwork—even before you have specific stories in mind—is a great way to build trust, open doors, and develop story ideas. Often, immigrants and refugees are suspicious of the press, which tends to be more reactive, swooping in to cover home invasion robberies, murder-suicides, welfare fraud, and other negative news, than proactive, which means learning about a group of immigrants and writing stories that put them in historical and social context first. By the time I wrote the Orphans of History series, I’d written about seventy Hmong stories over seven years. The series ended up being a fifteen-month-long project that tackled several explosive issues that had been ravaging the roughly two hundred thousand Hmong in the United States: gang violence, deteriorating marriages, a wall between parents and children, who often couldn’t communicate because they didn’t speak the same language. The story on Julie Chang, featured on this site, is the final installment. It is next to impossible to report on cosmic themes without a hook, an angle, a way to focus the story so you and your readers don’t drown in it. I finally found an opening when my mentor, the great Korean-American journalist K. W. Lee, came across the Thao family, which had three sons in prison for separate gang murders. Lee, then a consultant for a Sacramento TV station, couldn’t get his bosses interested in the story, so he took me to meet the family of Nou Her and her husband, Yong Chue Thao, a former captain in the CIA-financed Hmong army. Our gatekeeper was Pai, the Thaos’ very bright eighteen-year-old daughter, who was fully bilingual and wanted to see the story done—to help her brothers, whom she felt had been shafted by the criminal justice system, and her community, which was being torn apart by more than a dozen Hmong gangs. In many immigrant families, teenagers like Pai—whether they like it or not—serve as a bridge between their parents and the outside world. After K.W. Lee introduced us, I spoke with Pai—and, through her, her parents—for more than an hour, drawing out their life stories while several of the younger children listened, hearing parts of the story for the first time. And that’s the way I always start—respectfully, patiently, good-naturedly asking folks about where they were born, what their parents did, what their homes and villages were like, how they met their husbands or wives, their journey to America, and their experiences and trials once they get here. Sometimes, it takes an hour until the most revealing stuff surfaces. Other times, it takes weeks. Over the next 10 months, I went back to see the Thaos at least a dozen times. Sometimes, I’d go with an interpreter or community activist. Other times, I’d just show up and rely on their kids to translate. The Thaos’ youngest son, Jer, sixteen, seemed destined to follow in the tragic footsteps of his older brothers. And Jer didn’t speak or understand Hmong well enough to communicate with his parents. We called him the “Where’s Waldo?” of the Sacramento Unified School District because nobody seemed to know where he was supposed to be enrolled. He missed school for more than a month before his parents figured out what was going on. When he finally returned to Burbank High School in south Sacramento, photographer Anne Williams and I went with him. There, we met a Hmong teacher who sponsored a Friday afternoon Hmong club. At the club, we heard Hmong teens lamenting about how hard it was to talk to their parents, whether about school or about what happened back in Laos. But there was one teenager, Julie Chang, who stood out. She said she hadn’t gotten any sleep the night before; she was so busy taking care of her parents, her sick grandmother, and her ten younger siblings (nine brothers and a baby sister) that she hadn’t had time to start her homework until after midnight. But Julie wasn’t complaining. “I’m proud of my culture, and proud of my family,” she declared. 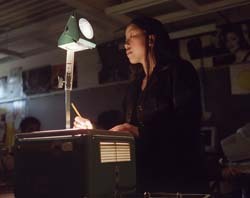 On top of all her responsibilities at home, Julie, sixteen, was a star at Burbank High School, where she helped teach the Hmong language class, led the She Club (an Asian girls’ club), and maintained a 3.5 GPA—even though she’d been in the United States less than five years and had learned very little in the Thai refugee camp where she had grown up. I interviewed Julie after school while she was waiting for he mom to pick her up. Animated and full of life, she seemed like the perfect link between ancient Hmong values and twenty-first-century American opportunities. She honored her culture but couldn’t wait to go to her first movie, her first dance, her first all-you-can-eat buffet. Over the next few months, I visited Julie’s family in their crowded south Sacramento apartment, where I witnessed Julie and her brothers in action. Photographer Anne Williams and I showed up at 5:30 a.m. one weekday morning only to find that Julie had already showered, dressed, and cooked up a giant breakfast of fried hot dogs, green beans and freshly steamed rice. I made a point of interviewing Julie’s parents and grandmother separately, when each had plenty of time and the kids were otherwise occupied. I had to interview her dad on Sunday, when he finally had a day off from washing rental cars at the airport. I interviewed him with the help of Mai Xi Lee, a Hmong guidance counselor at Burbank who had taken an interest in Julie. During the interview, I noticed two traditional bamboo flutes hanging on the wall. They belonged to Julie’s younger brothers, fifteen-year-old Meng and Tou, thirteen. The flutes not only made for an interesting detail but generated another rich story about their teacher, a highly respected Hmong shaman and flute player who was passing on his gifts to a dozen young Hmong. Observing such details is critical, especially if you are developing a beat on immigration. Julie’s looks, brains, and work ethic had attracted many suitors (in Hmong culture, it’s not unusual for Hmong girls as young as twelve to be married off). I found that as many as sixty Hmong girls at Burbank High were already married. Not all these marriages were voluntary. According to Hmong custom, it’s OK for a Hmong man (or youth) literally to kidnap a girl into marriage, as long as his family and hers can agree on a dowry, or bride price, which can range from $2,000 to upward of $10,000. Sadly, many of these early marriages are collapsing in America, as Hmong women realize they don’t have to stay married, especially to someone they didn’t choose in the first place. Some are leaving abusive husbands. Others are leaving husbands more than twice their age. Then, there are those Hmong women who wake up at age thirty—after seventeen years of marriage—and realize they never had a chance to be teenagers, or go to school, or to experience true love. So they disappear, often leaving their beleaguered husbands to care for six or nine children. Such observations, gained through a lot of research, offer important story lines delving into the depths of an ethnic culture. Before we told Julie’s story, we published an in-depth piece on Hmong women in the United States. The story featured May Ying Ly, the visionary founder of the Hmong Women’s Heritage Association, which began as an all-volunteer group that met to discuss the problems women had with their husbands, in-laws, and children. The pressure to stay married is great. Every Hmong belongs to one of 18 clans, and whenever a couple is having marital problems, clan leaders on each side will intervene. But sometimes a Hmong woman’s desire to leave a suffocating marriage outweighs the shame she will bring on her family and her clan if she leaves. Julie vowed not to get married until she had finished college and embarked on her career as a teacher, nurse, or scientist. She even went on Hmong radio to declare that getting an education was more important than getting married early. Her father, Chang Lor, was wise enough to see that the family’s future rested on Julie’s capable shoulders. He bought her a computer, so she could do her homework. Julie’s mother, Chang Thao, was in no hurry for Julie to get married, either. “Don’t get married early,” she begged Julie. “You’re the only one who can help me.” Julie’s mom was swept into marriage at sixteen—she was brushing her teeth in the Thai refugee camp when Chang Lor claimed her. Fortunately, they happened to be in love and still are, eleven children later. We figured Julie Chang would provide a much-needed upbeat ending to a Hmong series laden with tragedy and hardship: Hmong girl makes good in the New World but doesn’t forsake her roots. In the summer of 2000, a few weeks before the series was scheduled to run, I phoned Julie on a Sunday afternoon and asked how she was doing. She said she was going to summer school during the week and then spending Saturday afternoons in the air-conditioned confines of Martin Luther King Jr. Public Library, researching alternative futures. Julie added that there weren’t any potential boyfriends in the picture. On Tuesday morning—less than forty-eight hours later—photographer Anne Williams came up to me at the Bee and told me Julie had gotten married. “That’s impossible,” I said. “I just spoke to her on Sunday afternoon, and she didn’t even have a boyfriend.” I immediately called Meng, Julie’s brother, who said, “Yeah, Julie kind of got married,” and was kind enough to give me Julie’s new phone number at her “husband’s” house. I called Julie, who confirmed that she was married but said that it was a long story. Reluctantly, she agreed to talk to me about it the next day. So while Julie’s husband, Kou Vue, a seventeen-year-old high-school student, took a nap, Julie explained what had happened. She admitted she was in shock—they’d never even dated, much less talked about love or marriage. Yes, she’d been hijacked into marriage but decided to go through with it of her own free will. When her mother had asked her if she wanted to back out and come home, she had said no. Julie believed Kou Vue loved her—somehow—and she was attracted to him, too. She knew he had a reputation as a nice guy and a good student, and he promised to support her dream of going to college. She added that it was too late to back out now, that to do so would ruin her reputation for life. Her parents agreed to take $6,400 for Julie’s hand in marriage, and on August 4, 2000, Julie and Kou were formally married at her parents’ apartment. We decided the best way to tell the story was pretty much the way we had told it—only with the surprise ending, which underscored the incredible hold Hmong culture has on Hmong in America. Today, Julie Chang, twenty, has three children. Her in-laws—mostly Kou’s younger sister—take care of the kids while Julie works as a receptionist in a furniture store and Kou works at a filling station. Her birth family has had its struggles. Meng had to have a growth cut out of his stomach, and Julie’s mom had uterine cancer. While her mother was in the hospital, Julie went home for two weeks to take care of her dad, her grandmother, and her nine siblings and found the house in a shambles. Julie earned her high-school diploma and occasionally daydreams of becoming a teacher. “I like little kids,” she said. “Kou supports it a lot; he wants me to go to school instead of working.” But for now, Julie is enjoying her job and her new life as a wife and mother and isn’t in any hurry to go back to school. As a journalist, there are two rules I try to live by: that I am a human being first and a journalist second and that I will do no harm unless absolutely necessary. So I took the extreme step of telling Julie what I thought. When I found out about Julie’s pending marriage, I told her that in the United States, you don’t have to get married right away, that she could finish high school first. Then, if she and Kou Vue were in love, they could get married. For about ten minutes, I tried—as diplomatically as possible—to talk Julie out of getting married and ended up getting us disinvited from her wedding. Being disinvited from the wedding didn’t really hurt the story. But I took a real risk by telling Julie what I, the supposedly objective observer, thought, because I could have dramatically altered the story—not to mention her life—if she’d listened to me. How did I justify this? Because I felt that as a human being and an American citizen I had some obligation to tell her what the rules were here, short of saying that being kidnapped into marriage is against the law. The other reason I told her was that she seemed so reluctant and sad about what was transpiring. I’m glad my big mouth didn’t alter the story’s outcome. But, on the other hand, if Julie didn’t know or understand her legal rights in the United States and went through with a forced marriage she didn’t want that ended in tragedy, my conscience would have bothered me for not speaking up. I didn’t tell her she shouldn’t marry Kou—only that by law she didn’t have to if she didn’t want to. What would you have done in my shoes?